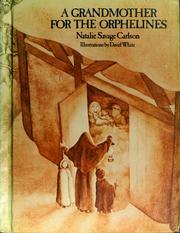 A Grandmother for the Orphelines is the final book in the Orphelines series, but only the fourth one that I have read. (We still haven't found a copy of A Pet for the Orphelines.) In this book, now that the girls have found both a brother to play with and a castle to live in, they find themselves really wishing for a grandmother. This desire is compounded by the announcement from their beloved Genevieve that she is leaving the orphanage to get married. Wedding plans and the arrival of a replacement for Genevieve distract the girls for a while, but as the holiday season approaches, the girls begin to hope they will find a grandmother in time for Christmas. I think this series will be some of the first chapter books I read aloud with Miss Muffet (currently age three). This last book was not my favorite of the ones I have read, mostly because it just felt like more of the same exact ground covered by the previous titles, but the characters and setting continue to be appealing. I think Miss Muffet, who has already shown an interest in stories about orphans, will connect strongly with the Orphelines and want to know everything that happens to them. It's also nice that the books are on the shorter side and illustrated throughout. It makes them a great choice for a first experience listening to longer stories. In terms of this specific book, it is a pleasant holiday story with a hopeful outlook and a happy ending. The way the Orphelines find their much-desired grandmother is far-fetched, but believable. It is a bit over-the-top the way these girls always manage to get whatever they want, and how they even try to control some aspects of Genevieve's wedding, but their behavior fits with the mood of the series and the girls come across as sweet and spirited rather than bratty. It's a fitting ending to a warm and cozy series of a type that is no longer published today. I'm glad to own a copy of this and several other Orphelines titles so that my girls can enjoy getting to know these characters even though the books are now out of print.